Military discounts: Starting this year, New Mexico residents who are active-duty military or veterans will receive 50 percent discounts on all licenses, permits and stamps. Documentation is not required at the time of purchase, but may be requested later. OK on bow fishing: Bow fishing now is a legal means to take game fish in reservoirs and lakes that are open to fishing. It is not allowed in special trout waters, rivers or streams. Fishing with crossbows is not permitted. Prior to going out, be sure to confirm that local ordinances or laws allow for the use of bows. Bear and cougar pelt tagging: The pelts of all harvested bears and cougars must be accompanied by a license and properly tagged by a Department of Game and Fish conservation officer or staff at an area office. Beginning this year, hunters who appoint a designee to present their bear or cougar hide for tagging must first report the harvest to a conservation officer themselves. When the hunter contacts a conservation officer, the hunter will receive a confirmation code and the name of the officer, both of which must be provided by the designee at the time of tagging. Pelts will not be tagged without that information. Cougar trapping: Trapping and foot snaring of cougars are legal only on private land with written permission from the landowner and on State Trust Land. Foot snares are prohibited on Game Management Unit 27 and those portions of Game Management Unit 26 (San Luis Mountains) designated by the U.S. Fish and Wildlife Service as critical habitat for jaguars. Jaguar critical habitat area in Unit 26 can be viewed at: https://ecos.fws.gov/ecp/report/table/critical-habitat.html by clicking the “online mapper” link. Neck snares are not a legal method of take. Legal trapping and snaring dates are Nov. 1–March 31. All other requirements and trap restrictions for furbearers (pages 121-123) apply to cougars. Rules for watercraft: All boats now are subject to inspection and possible decontamination before launching in New Mexico waters under new rules adopted to combat the spread of harmful aquatic invasive species. Rule changes include mandatory watercraft inspections and if necessary, decontamination before entering New Mexico waters. Complete rules are available at www.wildlife.state.nm.us/ais. 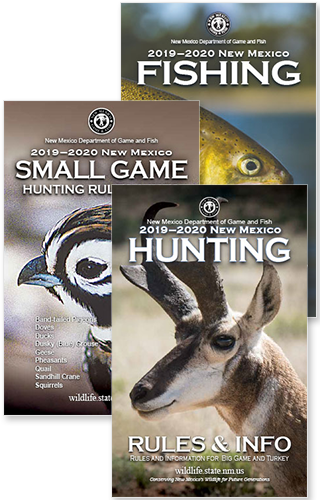 More information on all New Mexico hunting and fishing rules is available at www.wildlife.state.nm.us/home/publications/.